So You Want to Work in Fashion? How to Break into the World of Fashion and Design by Patricia Wooster. A So You Want to Be A Book. Review: Every person has a dream of what they want to be when they grow up. Some people want to be doctors, while others want to be chefs. But others have a dream of being in the fashion industry. 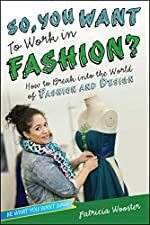 So You Want To Work In Fashion by Patricia Wooster is perfect for people who want to fulfill that dream. In this book you will learn about all the different jobs in the fashion industry. This book includes interviews with young designers and types of jobs you can get in the industry. There are many different types of jobs in this business and not all of them are designing the clothing. If you are into watching reporters on the TV as they report the newest trends ,then you would have a good time in the fashion industry. Have you ever heard of Courtney Allegra? You most likely have not, because she is a young and new designer. In ÒSo You Want To Work In FashionÓ there are 12 chapters of all you need to know about working in the fashion business. Other jobs include designer, stylist, production, retail and public relations, and model and photographer. I know what you are thinking aren't stylists and designers the same thing? The answer is no. In the beginning of the book you learn about the basics of each job. In this book you will also learn about what kind of degrees you will need for each job. Every chapter includes one or more interviews with young people with big dreams on becoming a famous designer. There is a quiz that may help you where your creativity would shine in. Then as the book gets going it tells about designing. If your dream is to make the sketches for the clothing than this job would be perfect for you. I will say this again designing and styling are different things, that is why there two different chapters for them. Public relations is a good job for you if you like numbers. Retail is a good job if you want to sell the newest clothing. If you want to report the newest fashion or maybe you want to write reviews in a magazine, than working in the media is the job for you.. If you want to be the person who walks down the runway in the designer's newest clothing, you would want to be a model. If you want to take photos of the people walking down the runway than you would make a great photographer. The best part of the book is about fashion as a career. You can learn about where to go to become better at your job and learn that fashion as a career is different than fashion as a hobby. If there was a word in the book that had something to do with the fashion world then it should be in the glossary. So You Want To Work In The Fashion Business is a great book and this book would be great to get for a person you know who loves fashion. If fashion turns out to be a job that you don't want, then you should know that So You Want To Work In The Fashion Business, is part of the Be What You Want series, and if they are anywhere as through as this one, then they worth the read. My favorite part of the book was the interviews because they featured teenagers and children that I would be able to relate to. We would like to thank Beyond Words for providing a copy of So You Want to Work in Fashion? How to Break into the World of Fashion and Design for this review. Have you read So You Want to Work in Fashion? How to Break into the World of Fashion and Design? How would you rate it?